Newt Gingrich wrote a new book to help people understand the ins and outs of President Trump. 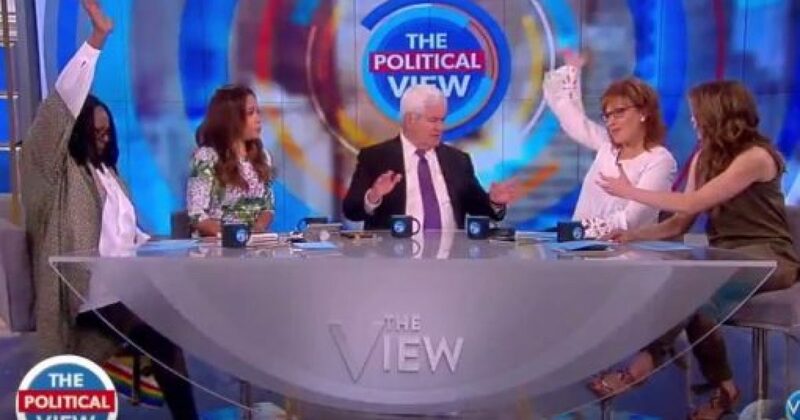 During an interview on The View, Gingrich schooled the Leftists determined to bring the Trump presidency down. “If you go back and read his testimony, a lot of this puff shrinks.” Gingrich said. Then, Behar questioned Trump’s handling of Comey. “He called Trump a liar,” she quipped. As we previously chronicled, Comey and Democrats were already thick as thieves. First Comey tells Trump over and over that he’s not under investigation. Then, after being fired, he suddenly has all these notes to document his uncomfortable meetings? And then he claims he wanted a special counsel for a man not under investigation. The irony comes into view, when you consider Comey’s testimony of the interference cause by then-Attorney General Loretta Lynch who worked hand in hand with the Clintons, yet, Comey never sought special counsel for their malfeasance. Gingrich acknowledged that Comey is a disgruntled ex-employee out to get Trump. Perhaps the funniest part of the exchange came when Gingrich took aim at Hillary second failure at becoming president. “I think he found more than enough about Mrs. Clinton which is why she’s still Mrs. Clinton,” Gingrich said. Whoopi Goldberg didn’t understand regular English, and asked for an interpreter. It’s unbelievable that a brawl didn’t break out on set. However, even through the tense moments of disagreement, the group maintained fake smiles. It’s amazing how the truth diminishes arguments of the Left. Additionally, the skewed media turned out to be the hottest topic on the panel. Gingrich said 99% of the reporting towards Trump has been negative. He said that President Trump’s supposedly low approval ratings are based on this complete negativity. Then of course there is the fake news. The media jumped all over this story, yet there was nothing substantive. And these Leftists have the nerve to say that Trump is the liar? Remember when Goldberg compared Trump to the Taliban? Yet, she fails to mention Obama’s real ties to terrorist organizations. These women practice selective politics. If Obama did it, it must be good. If Trump did it, it must be bad. They know in truth that both are opposite.